I’ve been seeing chatter on both Facebook and some of the blogs I follow about the Best Christmas Gifts given or received this year. My 'best' actually encompasses both the give and receive categories, but first a little back story is in order. In February I decided to start a creative writing workshop for incarcerated women at the county jail, so I spent some time on the Internet researching model programs. Surprisingly, I found very little. Outside of the PEN American Center’s Prison Writing Program, I found one program in Western Massachusetts for incarcerated women that uses Pat Schneider’s AWA method, one originally developed for use in her writing workshops with low income women but later adapted for use with other marginalized populations. Armed with some basic ideas, I drew additional inspiration from my own experience teaching diverse adult populations over many years and wrote a proposal to the jail administration. After 9 months of negotiations, personnel changes and personal setbacks that delayed its start, we ran the first workshop on October 2nd. 5 women attended. The next week, the facility was in lock down. The week after that, no one showed for the workshop. The following week, a few women returned from the initial meeting, others had lost interest, and still others had been released. Since the workshop ‘pilot’ was open only to the “worker” classification of inmates—those usually incarcerated for shorter durations—we limped along in fits and starts for the first couple of months. Weekly I heard from those attending the workshop that there were many women who wanted to come but weren't eligible as non-workers. After some diplomatic negotiations with the Captain, the workshop was opened to all of the women in the facility, but with limited participation of 6 per workshop. In the weeks since, we have been running at capacity with reports from those in attendance of having to fight for their spot. They tell me it’s a get set, get ready, and go! to line up for admittance and that if they’re not fast, they don’t get in. With a more consistent group, we’ve been able to build off of each preceding workshop. We started with a look at words and some of the popular devices used in poetry—alliteration, repetition, rhyming patterns, concrete vs. abstract imagery, onomatopoeia, clichés, and fresh ways to use language—and looked at poems that effectively use these devices. Then we wrote. We began with Haiku practice. For those that didn’t want to write poetic line, they could write stream-of-consciousness or whatever they liked either on a topic of their choosing or from prompts that I provided. (I’ve had one gal the past two weeks who has been writing in a tone and style that is a cross between medieval literature and a Harlequin Romance). In the past month, I’ve started bringing their writing home and typing it up for them so they can see their words in print. I give them back two versions—one just as they’ve written it and the second with light penciled comments, suggestions and encouragement for further development, if they so choose. I’ve brought them Rumi, Carroll, Frost and Levertov, Oliver and cummings and Snyder, and then when they asked for Shakespeare, nursery rhymes, Psalms & Proverbs, and more Beat Poets, I brought those, too. This past Saturday, on Christmas Day, I brought them all of the above and one more gift: enclosed in red and green envelopes a slip of paper with the address of the PEN American Center where they can send for a free handbook for writers in prison. I also brought them poems by the 1st, 2nd and 3rd place winners in PEN’s Annual Prison Writing Contest, proof that voices of writers inside are heard and published. Not all will continue writing when they leave the county jail, but for some of the women in the workshop who already know they are headed for prison sentences, writing may be a comfort during the months and years ahead. One thing is certain. Our workshop was the greatest gift I gave and received this Christmas. It seemed so for them as well. Taken with permission from Claudia Mosby's blog page www.awordylife.blogspot.com. Claudia Mosby is fascinated by the power of words to influence, inspire and heal. She became a freelance feature writer so she could tell people’s stories. She lives in the North State and leads workshops, classes and retreats on writing and wellness. 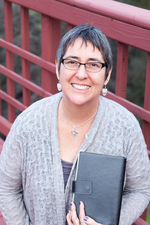 Visit her website at www.writinginsideout.org.